Link returns in The Legend of Zelda: The Minish Cap which takes the series back to its roots through classic The Legend of Zelda gameplay while simultaneously adding a host of new gameplay elements and gimmicks that make the experience even more enjoyable. Sound good? That’s because it is good and every GBA owner who’s ever enjoyed a Zelda game or who enjoy clever and quality gameplay should add this game to their collection. The Minish Cap is a magical hat that resembles a green goose and that is quite talkative and not shy about offering advice. The cap’s real power comes in its ability to shrink its owner to a miniature size at special locations in the game’s world. This power is key to Link’s success in his latest quest to save Zelda, which can only be done by reforging a magical sword. The catch is that the secret to the sword’s reforging is held by the Minish, a race of tiny people who go unnoticed by the normal-sized people of Hyrule. As Link you’ll need to move between both the normal and tiny worlds as you seek to remake the sword and save Zelda. 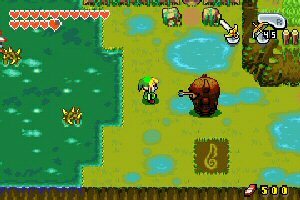 The game takes place in a colorful and animated Hyrule. If you played any of the classic Zelda games before then The Minish Cap will at first look like an old friend. You’ll see the familiar 2D maze-like world that you navigate by moving a screen at a time and hear the familiar classic theme music play as you fight roaming monsters while looking for hidden dungeon entrances. However, the game is much more than a throwback to the NES days. The graphics are more colorful and everything is more animated than in the Zeldas of old, and on closer inspection you’ll find little mouse hole openings and tiny gaps between the rocks. These lead to areas that can only be explored when you have shrunk down to Minish size, which opens up a whole new dynamic to the gameplay and makes for some very clever puzzles. When you are shrunk down to Minish size Link appears as a tiny dot on the screen, but a little balloon pointer will float above his head so you can still keep track of where you are. You’ll be able to enter those little mouse holes that you saw before, climb skinny vines, and squeeze through tight gaps. On the other hand, puddles become impassable lakes and pebbles become boulders to block your way. Because of this, the over world is really two maps at the same time, with completely different routes and obstacles depending upon your current size. There are also some special Minish only areas that are a visual treat as you navigate your way through grass forests and under leaves and twigs. Puzzles will often require you to switch back and forth between regular and Minish size, so when you’re small you need to be on the lookout for items that will help you when normal-sized and vice-versa.